With more than 20 years of experience in the technology, financial staffing, and consulting industries, Bill Peppler, COO is responsible for overseeing operations and developing additional new markets for Kavaliro across the United States. Before coming to Kavaliro, Peppler worked in the Orlando, Seattle and San Diego markets for international staffing and recruiting organizations. He has recruited for clients such as Microsoft, Amazon.com, Boeing and various Fortune 500 customers. After establishing an office in Seattle, he was offered an opportunity to do the same for clients in Southern California. 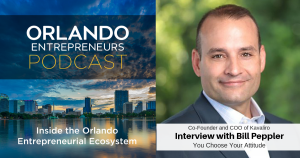 He has been recognized as an employment expert in such publications as CNN Money, Bloomberg BusinessWeek, Inc Magazine, Fortune Magazine, Orlando Business Journal and The Orlando Sentinel among others. Peppler has lead Kavaliro to being named as a Best Place to Work in various Business Journals, successfully had Kavaliro named to the Inc. 5000 7 consecutive years, and has brought about technical innovation that provides custom-tailored solutions. Peppler is also a Founding Partner of the successful HR technology company, FYRE, which had a successful exit through strategic acquisition to Peoplenet/BullHorn in only 36 months and is still a leader in the HR automation industry.